The BrewEasy™ is a revolutionary new ultra-compact and economical all grain brewing system. This patent pending system and process utilizes a two kettle recirculation infusion mash system called the Kettle-RIMS™ or K-RIMS™ process for short. This system is very simple to use and is a very approachable way to transition from extract brewing into all grain brewing. The BrewEasy™ provides all the simplicity of a brew-in-a-bag (BIAB) system, but eliminates the cloudy wort, messy lifting, and does so with much better efficiency! 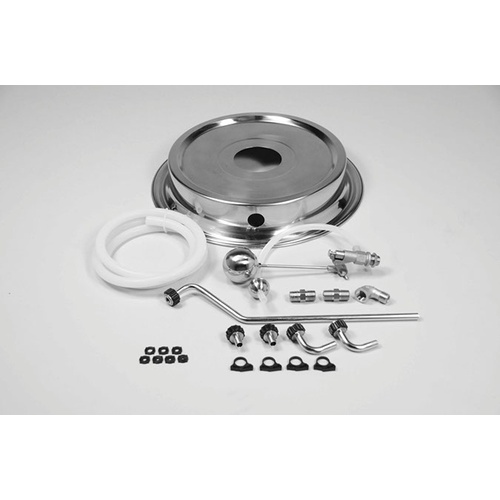 This Turnkey Kit includes all of the necessary equipment to produce 10 gallon batches of beer from the BrewEasy™. Mash in the upper vessel, while using the lower to recirculate wort and raise mash temps as necessary. Recirculation flow rate is controlled by included orifices, allowing for 6 flow settings from 0.5 - 2.0 gpm. After conversion, simply open your Mash Tun valve, letting your wort drain into your Boil Kettle, at which point you're ready to boil and should be getting your hops ready! Already own some Blichmann gear? Check out the modular BrewEasy™ Lid Adapter Kits. These are designed to upgrade your system if you already own the Burner, Pump, and appropriately sized Kettles. Please Note: Optional KettleKart shown in picture is not included with this setup. Check our New Products Page for updates on availability of the KettleKart!